Receive a FREE PACK OF SEEDS for Earth Day! Enter code EARTHDAY at checkout. Click here for details. 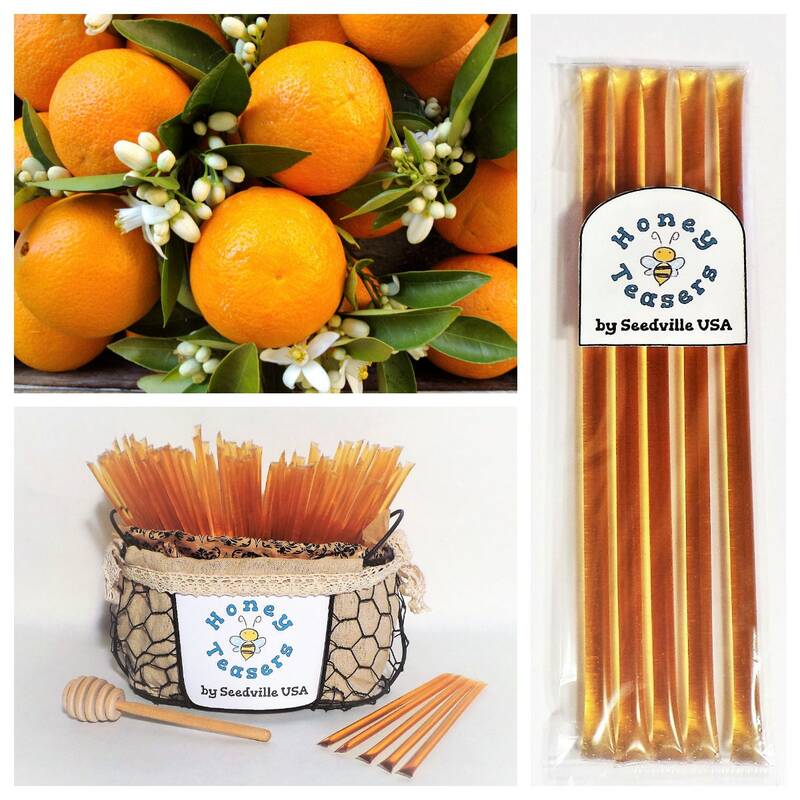 Seedville USA’s Honey Teasers are the perfect snack to enjoy at home or on the go! They are delicious, nutritious, & convenient! 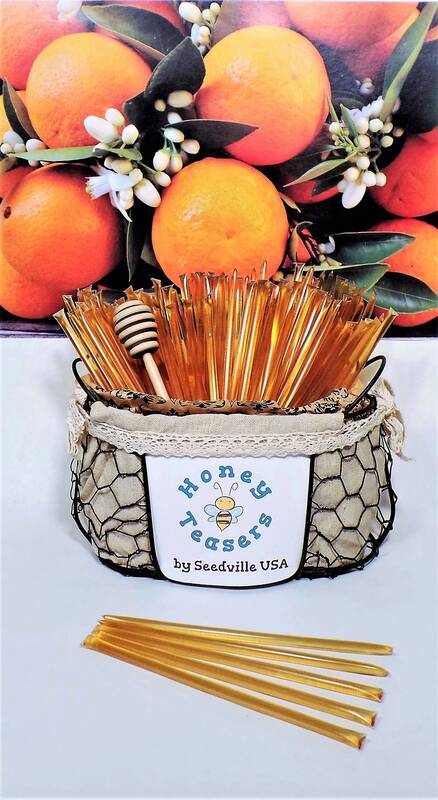 Honey Teasers are 100% pure natural & naturally flavored honey in a straw. Each 7” long Teaser contains 1 teaspoon (5 grams) of US Grade A Honey. 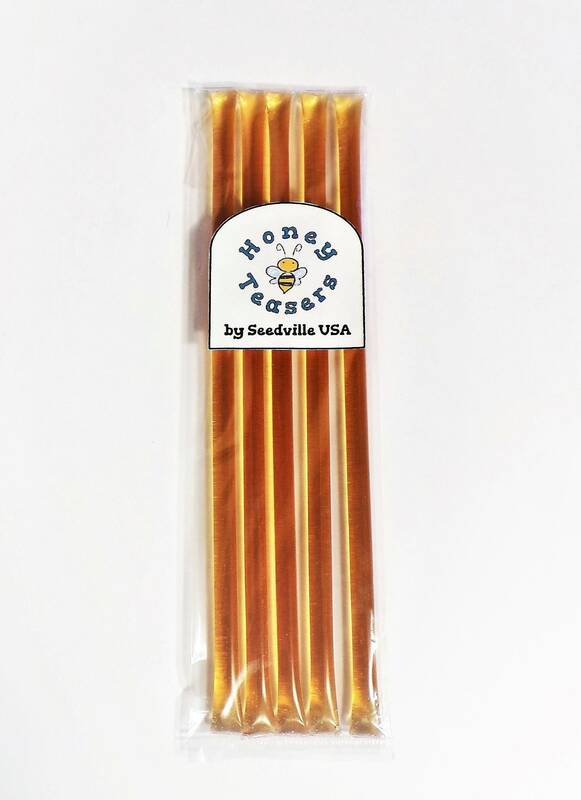 Seedville USA's Honey Teasers come in packages of 5 sticks each. Honey Teasers are an excellent snack enjoyed on their own. They make a wonderful topper to sweeten any treat such as breads, fruits, cereals, or my personal favorite - french fries. These 'to go' straws are the perfect companion for beverages like coffee or tea since they are their own stir stick. Enjoy Honey Teasers at any time – Just toss them in your purse, lunch box, or briefcase. The individually sealed straws are easy to open – Just bite or pinch the end of the straw & enjoy! Honey is made by bees from the nectar of flowers - this natural sweetener is a great healthy alternative to processed sugar snacks. Honey is a blend of sugar, vitamins, minerals, & amino acids. It has antibacterial, anti-fungal, and antioxidant properties. The sugars are an excellent source of healthy natural energy that can give you a quick & natural energy boost. Honey Teasers are just 15 calories each & are fat free. Contains Vitamins: B-Complex, A, C, D, E, & K.
Contains Minerals: Calcium, Iron, Magnesium, Phosphorus, Potassium, Sodium, Copper, & Zinc. Contains 18 Beneficial Amino Acids. The straws are made of BPA-free food grade polypropylene. They are Orthodox Union Kosher Certified. Caution: Do not give honey to infants under 1 year old. 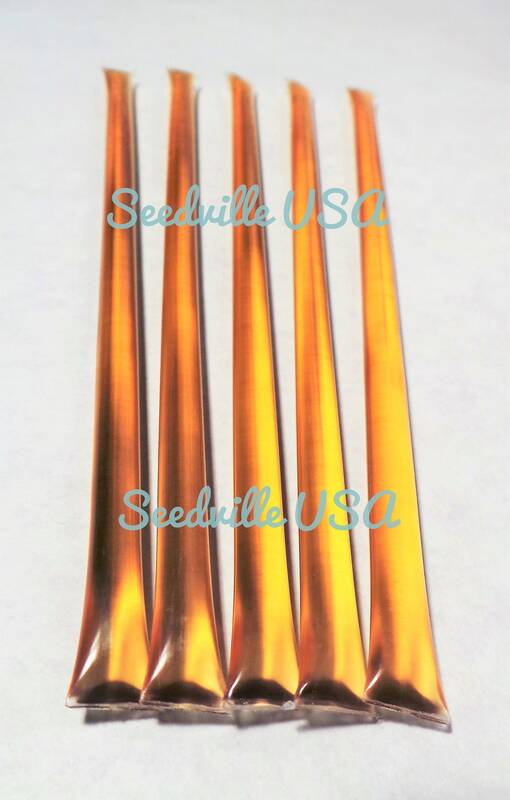 Looking for a large amount of our fabulous Honey Teasers? Just message us for custom quote! Whether it's for a business promotion, wedding favors, or special birthday party, your guests are sure to love this delicious take away that will leave them with sweet memories of you! We would be delighted to work with you personally to create custom labels to commemorate your special event! Pay Just One Flat Shipping Fee No Matter How Many Packs Of Honey Teasers & Seeds You Order! All Orders Are Shipped The Same Or Next Day With Tracking Info Provided. VISIT OUR STORE FOR OVER 1,700 TYPES OF FLOWER, HERB, TREE, FRUIT, & VEGETABLE SEEDS! International Buyers – Please check with your local customs office before ordering to make sure that honey is allowed to be imported to your country. Combined free shipping applies to an unlimited # of seed packs and/or Honey Teasers paid for together at checkout. USPS Priority Mail is available as an option for anyone needing expedited delivery. Copyright © 2011-2017 Seedville USA. All Rights Reserved.